Despite its address, this is not a Fifth Avenue building. Incredibly, the Manhattan Borough President's office created this address to the delight of the developers, Jack C. Heller and Duncan Macaulay and the dismay of address purists. Borough Presidents in New York have considerable authority to assign addresses and create new ones, although usually such actions involve the creation of a special "plaza" address. For marketing purposes, of course, a Fifth Avenue address is very valuable. 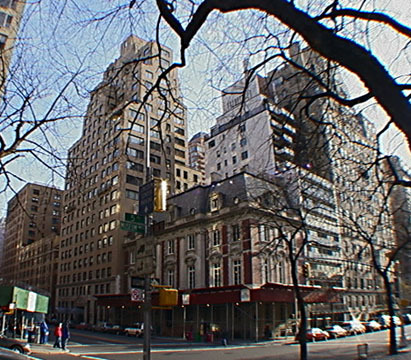 This condominium apartment building is a renovation of the former Adams Hotel, whose address had been 2 East 86th Street. The building is adjacent to the very handsome and large mansion designed by Carrère & Hastings in 1914 at 1048 Fifth Avenue that was originally the William Starr Miller residence, then the residence of Mrs. Cornelius Vanderbilt and then the Yivo Institute for Jewish Research and since 2001 it is now the Neue Galleries, founded by Serge Sabarsky and Ronald Lauder and specializing in German Expressionist art. The conversion of this property was completed in 1992 and was major. The 23-story building has only 54 apartments, only 4 of which are smaller than two-bedrooms. The beige-brick building, which relates contextually to the former Croyden Hotel that occupies the remainder of the block to Madison Avenue, was given an elegant new entrance and a redesign of its lower façade while some nice gargoyles were kept higher on the façade. The building has several terraces and its western façade was significantly altered to provide picture windows for views of Central Park over 1048 Fifth Avenue. Although this building does not have a health club and pool, or a garage, it does have elevator operators and refrigerator storage for deliveries, storage room, bicycle room, individual room climate control, laundry facilities within the apartments and some fireplaces. The canopied entrance has a revolving door. It has an extremely handsome circular lobby that is paneled in dark wood. Costas Kondylis Architects designed the conversion. This building has an excellent location that is very close to Central Park, many museums, several private schools and religious institutions and good local shopping and transportation.